In the previous article, trees from the Grassland Biome that makes our gardens exciting and the feathered friends happy, were discussed. In this issue the focus will be on shrubs and small trees. In an environmentally friendly garden, it is important to create different “layers” of plant growth to simulate the habitat that occurs in nature. 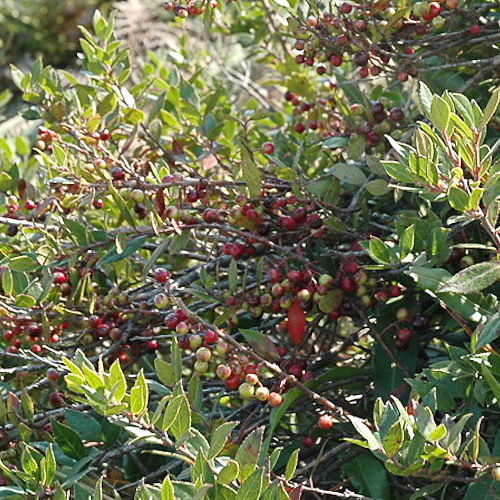 The shrub “layer” forms the middle layer that creates a habitat for birds that feed on the ground. One bird worthy of having in your garden is Burchell’s coucal that loves this kind of habitat. Just to recap, The Grassland Biome is found chiefly on the high central plateau of South Africa, and the inland areas of KwaZuluNatal and the Eastern Cape. Most of the Witwatersrand falls within this veld type. One worthy of growing in dappled shade (or sun) is the frost hardy dogwood, Rhamnus prinoides. The leaves are always a shiny, dark green and the small black berries are a great favourite with birds. A small tree that is similar in appearance, although not as hardy, is the bladdernut, Diospyros whyteana. 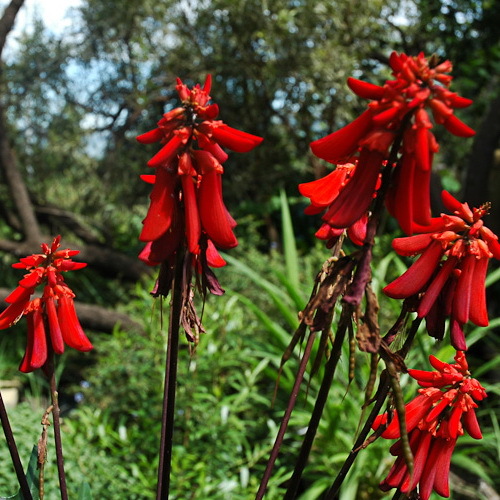 A shrub that is almost compulsory where the frost is not too severe, is the dwarf coral tree, Erythrina humeana. It can tolerate dappled shade, but flowers best in full sun. It bears masses of red flowers starting in December that last for two months in summer. 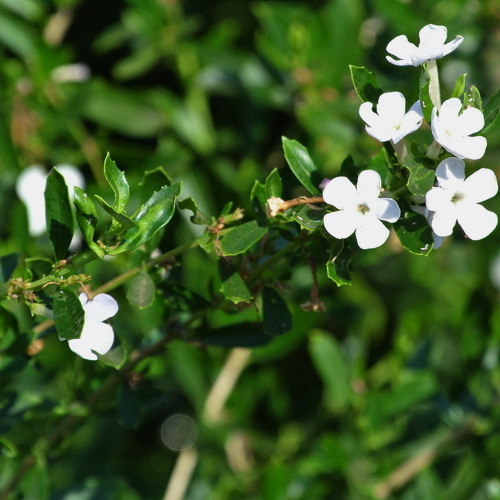 It is a great favourite with sunbirds and really suitable for small gardens. For a sunny spot, not many beat the nice grey foliage of the cork bush, Mundulea sericea. 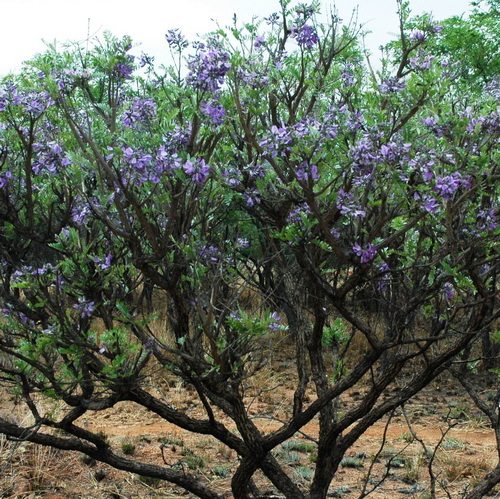 It flowers twice a year and is reminiscent of a small Jacaranda when in flower. It is quite hardy and will even thrive in a clayey soil. For a dry spot in the garden, try the fire-sticks, Diospyros austro-africana that is very hardy. The rather small flowers lure insect pollinators that in turn excite the flycatcher, white-eyes, robins and thrushes. The fleshy round fruits are a great favourite with mousebirds, barbets and bulbuls. The blue honeybell bush, Freylinia tropica, is a great favourite with butterflies that feed on the copious amounts of nectar. It grows relatively fast and can be trimmed once a year to keep it neat. It is very frost hardy. If you have a bit of patience, try the evergreen Cape myrtle, Myrsine africana. It is equally happy in partial shade and sun. It is a slow grower and hardly reaches two meters in height. It is ideal for a small garden. The blue-black berries, borne in summer, attract many fruit-eating birds. 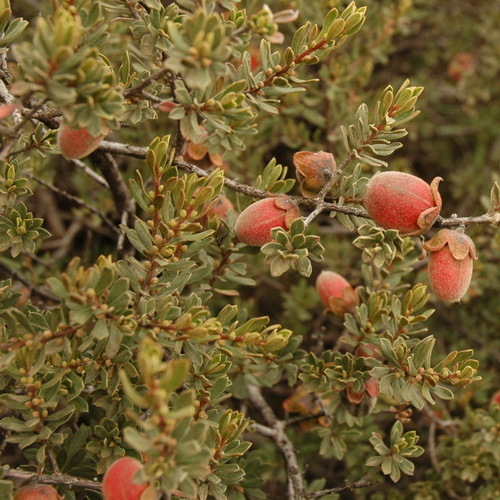 For more information on many of our indigenous plants, try the South African National Biodiversity Institute (SANBI) website, www.plantzafrica.com. Please tell us some of your experiences or indigenous plants that you have grown successfully in your garden.